Brighton is a town that is often over-looked by those seeking a fine dining experience. For many, the south coast town is more synonymous with fish and chips, hipsters and stag parties than Michelin stars, but the recently opened Pascere is aiming to change that. When we saw reviews raving about the modern-British restaurant, we set off down South to see if it could live up to its early acclaim. Set across two levels, the restaurant is visually intriguing with a combination of plush traditional furnishings and modern fixtures. The large windows overlook Brighton’s famous Lanes where one can spend hours watching the town’s diverse mix of dwellers. We were seated upstairs where we could watch Head Chef Johnny Stanford and his team work their magic from the customer-facing kitchen. Pascere’s menus demonstrate Stanford’s flair for serving creative, elegant food, including an all-day selection of small plates, an á la carte lunch and dinner offering, and an extensive evening-only tasting menu which despite not trying looked excellent. 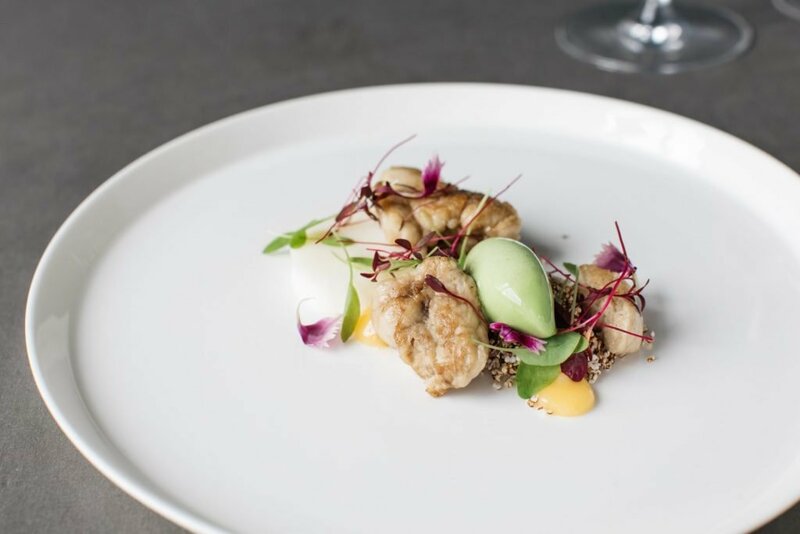 To start we sampled the dazzling Pan fried lamb sweetbreads where the rich meat was creatively paired with sweet tasting ewe’s milk panna cotta, ewe’s curd and sorrel ice cream. Other option to start include a superb Beef Cheek Tortellini and an English Pea Custard. The main courses include a fresh Pan fried Stone Bass and a King Oyster Mushroom, but the stand out for us was the Roast Goosnargh Duck Breast. Perfectly cooked duck is enhanced with a flavourful duck liver parfait, sweet cherries and rich pistachio. The presentation and pride that went into each dish that left the near-by kitchen was impeccable and testament to what owner Amanda Menahem and her team are building at Pascere. Dessert provided one of the biggest surprises of the evening in the form of Pascere’s Lavender Curd. As is the norm, we ordered the chocolate option which was a delicious rich and creamy mousse with malted milk ice cream and chocolate tuile though it was our guest’s choice that left us lost for words. The Lavender Curd with blueberry & violet sorbet and blueberry meringue (so foolishly overlooked by tmrw) was incredible. Served in a bowl it provided an intense hit of flavour, reminiscent of one’s childhood and similar to what can only be described similar to parma violet candy. It was unusual and unique and I cannot recommend it enough. Pascere is the shining star of a group of upcoming restaurants in the previously over-looked costal town – the food and service is impeccable, the menu is interesting without going too left-field and the ambience and décor is what you would expect of a quirky neighbourhood eatery. London is full of wonderful choices, but Pascere is worth the train fare south alone.